MarketWatch published an article earlier today that caught my eye. The writer, Wallace Witkowski, pointed out how the S&P 500’s 50-day moving average has served as a line of defense three times so far in 2013. 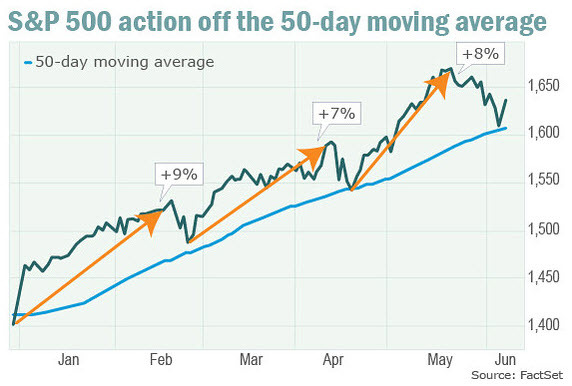 Each time that the S&P 500 declined to its 50-day average, the benchmark went on to rally between 7% and 9%. Last week marked the fourth time the S&P 500 kissed its 50-day average and again, the index shifted gears and turned up. Will the S&P 500 surge once again? Not so fast, says Witkowski; this time around momentum is waning. I pay a lot of attention to the S&P 500’s 50-day average, too. However, my approach to managing risk gives more weight to recent price activity by using an exponential moving average, as opposed to a simple moving average. In addition, I rely on a confirming indicator for buy/sell signals that measures price momentum – one created by my Dad in the 1980s. This momentum indicator gauges the strength of the up or down trend in order to filter out some of the whipsaws and losing trades. (Note that I still have whipsaws and losing trades. No system is fool-proof.) Currently, the S&P 500 is sitting only 2% above its 50-day exponential average and the momentum indicator I watch closely is about to turn negative. A couple of lousy days on Wall Street and a S&P 500 sell-to-cash signal is likely to trigger.